Each week, our favorite grocery store offers coupons for something free (well, at no cost beyond what we plan to buy, anyway; I believe everything in this world has some cost). Usually the item is something upon which we don’t normally splurge, like expensive nutritional supplies. Last weekend was no different. We brought home bottled water with added electrolytes. A taste test at home proved it really flat, as if distilled (don’t drink distilled water, by the way, I understand it is very bad for the human body). So I decided to steep green tea bags (flavored with Açaí, pomegranate, and blueberries) in a small portion of heated Body Armor. I was curious to see if it made my favorite iced beverage even more thirst quenching. 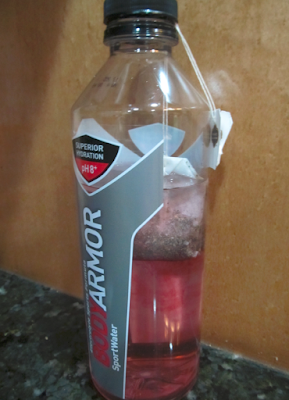 Typical for me, I ruined my own experiment by adding Brita pitcher filtered water to chill the drink. ~sigh~ Trying again, I put two more tea bags directly in the remaining bottled water. I’m going to let it steep at room temperature for a few hours, chill the bottle overnight, and drink it lightly sweetened in the morning. If I can drag myself to the gym I might take that instead of plain water. Is it just me or do you find warm beverages less thirst quenching? You are correct, chilled water seems to hit the spot better! But..I actually prefer my water to be room temp. I know....strange right? haha. By the way....great job on your working out! Wished I could just get back in to going to yoga. So.....was the water any better when it set overnight with tea bags in it? Tea....not even thinking that way right now, still working on the coffee! Oh...by the way~ Good morning! Have a great day. It was still off-putting. I mixed it with other tea infused water and managed to drink it. Hope you have a great day, too! I can't stand warm drinks ever. Interesting experiment. You'll have to keep us updated. Interesting, my friend. Basically, I didn't like that beverage at all. Yes, I do find warm beverages less thirst quenching. I do prefer warm ones though, especially this time of year.